Shell collage by Sarah Dennis c.1750 – £7500 at Bamfords. A group of Georgian shell and feather collages came up for sale in Derby – consigned to auction by a descendant of the prosperous Irish Quaker lady who made them in the mid-18th century. Estimated by Bamfords at an attractive £1000-1500 apiece, on January 23 three sold for £13,000 each and one at £7500 (plus 21% buyer’s premium). There were multiple bidders but all went to the same Irish buyer. Combining craftsmanship with decorative appeal, a rich provenance was also key to their appeal. Family history records suggest that these were the work of Sarah Dennis (nee Newenham), the wife of the Quaker merchant John Dennis, and displayed at Woodhill, a mansion once sited on the hillside above the River Lee in Cork. Perfecting her craft between c.1740-70, Sarah Dennis took the popular pastime of shell and feather collage to the level of an art form. 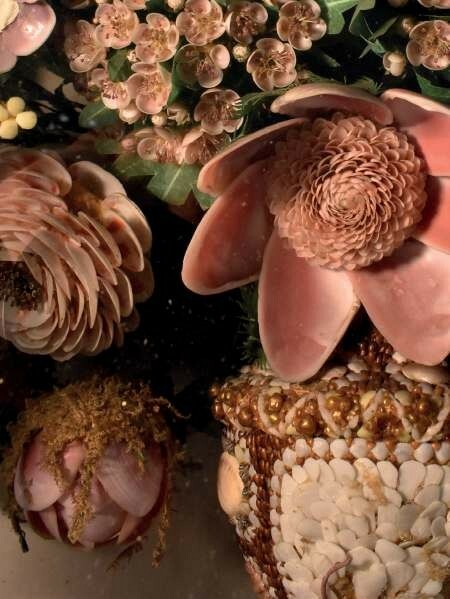 She fashioned grand ‘floral’ displays populated by botanically correct blooms and insects – the myriad seashells carefully chosen for consistency of colour, shape and size. Each of her finished works was housed in 18in (46cm) arched glazed cabinets with black and gilt japanned decoration. As Bamfords’ senior valuer Annabel Brammer put it: “They were so good. You really wouldn’t know they were made from shells.” She had not been surprised at the prices they fetched. 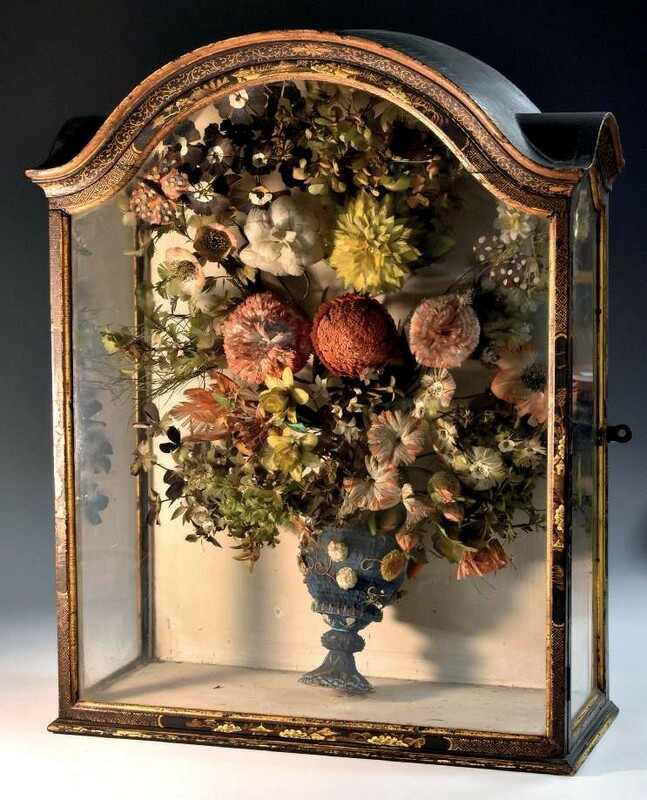 Close-up of one of the Irish 18th century shell arrangements sold at Bamfords. Dennis’ creations had remained at Woodhill when the estate passed to her only child Elizabeth and was remodelled by her husband Cooper Penrose, whose prosperous family enterprise included the glass factories in Waterford and Cork. Cooper Penrose’s will of 1815 records the bequest of ‘mother’s shell and feather work’ to his two daughters Elizabeth and Anne, while later accounts recall the sitting room at Victorian Woodhill still ‘overflowing with decorative shell and feather work’. The property was finally vacated in 1933 when many of the more valuable works of art were sold (a portrait of Cooper Penrose painted by Jacques Louis David in 1802 is now in the Timken Museum of Art, San Diego). However, family chattels were held in England and Derbyshire in particular. They included the cache of ancestral portraits, Cork silver, Chinese export porcelain and Irish furniture that, in 2008, was acquired from Penrose descendants and then donated to Cork’s Crawford Art Gallery. Last week’s sale of Dennis’ handiwork represented a rare purchasing opportunity – but it was not a unique one. Twenty-two years ago, Mallams Oxford sold another pair (seemingly from a different family member). As reported in ATG at the time, they sold at £24,000.